I may not of ever been a boy scout, but I am a firm believer in “Be Prepared.” When traveling with kids, anything that can happen, usually does at one point or another. That’s why I always pack a travel first aid kit. Like most things in my life, I opt for more natural products when selecting first aid supplies. With my kids, tending scraps and cuts are the most common medical care needed. So at a minimum I ALWAYS carry a small first aid kit with bandaids, antiseptic wipes, and a first aid suave. But when traveling there are other ailments to consider. I could buy over the counter first aid supplies/remedies when the need arises, but have you seen resort prices for things like pain reliever? Individual medicine packs are expensive!! Plus, more natural remedies are not easy to find. My solution is to plan ahead, pack my own remedies/solutions, and be prepared for anything. That way, I’m ready to have fun while on vacation! Disclosure: This blog contains affiliate links. When you purchase these links and we receive a small commission without any extra expense to you! I’ll only recommend and share products that I use and love myself. Thanks! I’m not a medical professional, but this is what I take on family trips and why. 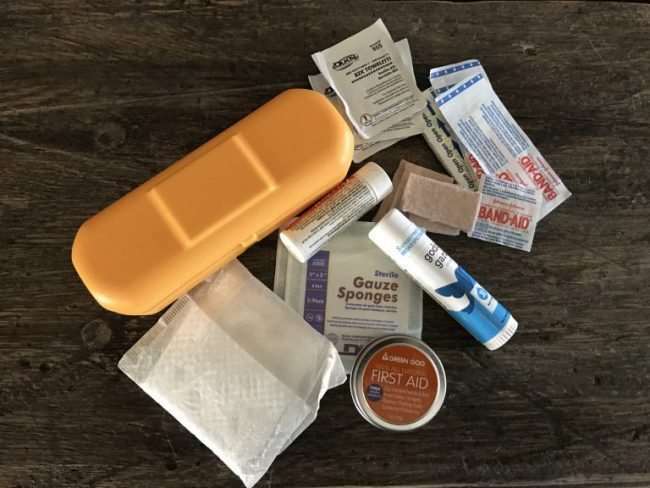 These are essentials in every first aid kit. Cuts and scrapes are the most common issues we have. A variety of sized bandages is essential when going anywhere with kids. I carry at least 2 sterile gauze pads in my kit. You can use them to clean up a wound, apply pressure to a wound, stop bleeding, or use on a wound that is bigger than any bandaid you have. Antibacterial or antiseptic wipes rounds out my top 3 first aide kit essentials. Many forget about these, but they are very necessary to clean out wounds before placing a bandage on. Not necessarily essential, but good to have in a first aid kit. It will hold gauze in place, help close smaller cuts, or used as a temporary brace for broken fingers. It has other non-medical uses too when you just need tape. Pre-cut squares of moleskin are great for blister care or protecting developing hot spots on the feet. They provide protection a cushion for a blister or sore. You buy it on larger 4” squares and I cut it down to 1/2” squares be used immediately. I used to carry different products for antibiotic ointment, sunburn, itch relief, etc. Now I just use a first aid salve that does it all. I like this one from Green Goo. It’s all natural with chickweed, yarrow, sage, calendula, and comfrey. It soothes and protects without taking up a lot of room in my travel first aid kit. For the adults, I carry naproxen for headaches, muscle aches, etc. For the kids, I have a children’s strength acetaminophen. You can carry any type of pain relief you like. The older I get, the more I seem to be allergic to. I have found that having an allergy medicine for myself and my children is always a good idea. Some over the counter allergy medications make me groggy, but this one from Genexa is homeopathic and doesn’t make me sleepy. It’s also very effective. When you are away from home, you eat differently. Sometimes the food you eat doesn’t agree agree. Whatever the reason, an upset stomach can really ruin a vacation. There are plenty of OTC medications to help as well as natural homeopathic remedies. Each is for temporary relief of stomach troubles. Flying takes a lot out of you. For me, I tend to get anxious and irritable with early morning flights. Then struggle through the day while traveling. I tried this homeopathic Jet Lag medication and like that it helps with irritability, nausea, fatigue, and constipation. Traveling is stressful. Everyone is excited to get to their destination. Everything has to be packed. You have to get to the airport or train, thru TSA a security when flying, and make it to your destination. There are different ways to stay calm and manage stress. If you are taking a cruise or are prone to motion sickness pack your patches, pressure bands, or tablets to prevent nausea. The patches and pressure bands are a natural alternative to medication. For our upcoming cruise, I plan to pack homeopathic patches that go behind the ear and homeopathic petroleum tablets from Boiron. This is what I pack in my family’s travel first aid kit. 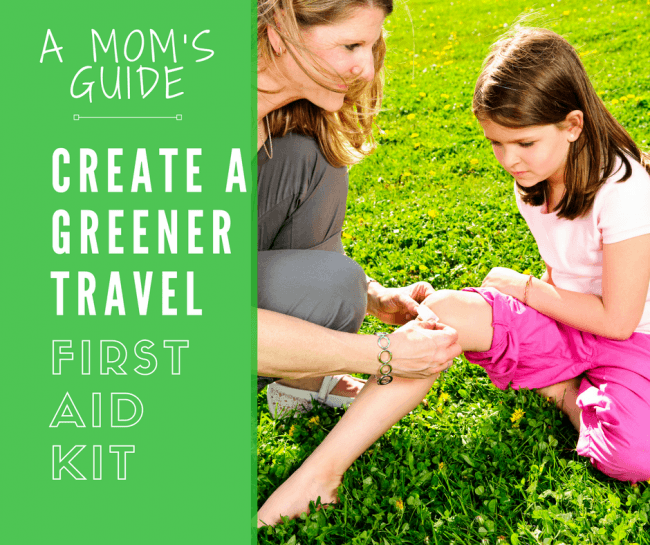 Get this full printable travel checklist and go pack up your own little first aid kit. Odds are you will probably never use it — and I hope you never do. If you do need it, at least you will be prepared and have peace of mind. * Important Note: The information provided here is for general travel information only. Always check with your physician, nurse, or pharmacist before you take any medication, especially if you have a specific medical history, condition, or allergy that general advice cannot cover. Note if traveling aboard: When carrying any generic medication, it is essential that it is kept in its original packaging when you are traveling in case customs officials need to check it. I enjoyed reading this list. Our first aid kit is similar, except for the jet lag medication (I never tried it, despite feeling quite poorly if jet lagged) : it’s great to hear there are natural remedies for it, I must ask what is available here. Thank you for the tips, I pinned this for reference!